Many people ask, “Where and how did Almighty God originate? 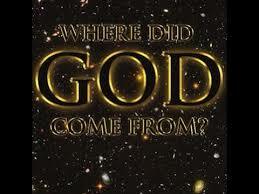 Where did He come from?” Almighty God had no beginning and will have no end. God said, “I, the Lord, the First and the Last, I am He" (Isaiah 41:4). Jesus said, “I am the Aleph and Tau, the First and the Last, the Beginning and the End” (Revelation 22:13). Our finite human minds find it very hard to understand, God is infinite. He always existed. He is self-existent and He gave Jesus authority to self-exist.